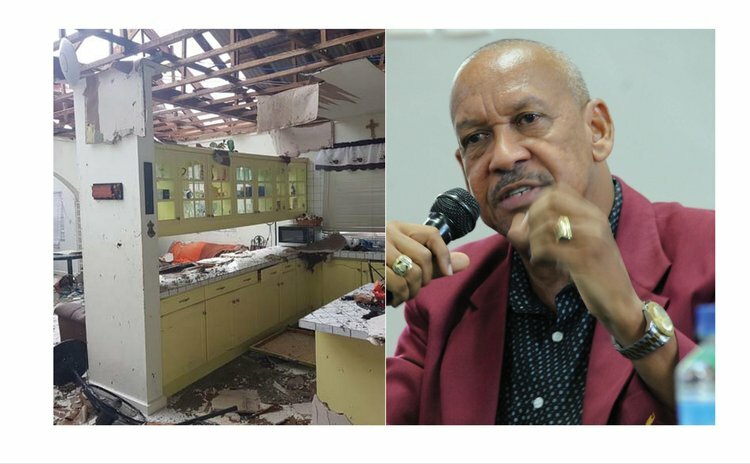 Billy Doctrove: "We had no roof and the rain was pounding"
Billy Doctrove, the retried International Cricket Council (ICC) Elite Cricket Umpire and FIFA Referee lost his roof during Hurricane Maria. Doctrove says the ordeal was "frightening and stressful." He give thanks to God for saving his life that of his family and neighbours. Here's how Doctrove describes his nightmare on 18 September 2017. "I was home with my family following the path of Hurricane Maria and I recognize that it was beaming down on us. However, I never thought that it would have ended up as a category five because I have never seen a hurricane develop intensity so quickly," Doctrove said. He said that between 6 and 6:30 pm he sat on his western porch overlooking the Caribbean Sea. There he shot a video and sent it out to his friends with the caption: "Maria, Maria, Maria is really here now" because the storm had really started to intensify. "We then went upstairs and the wind was howling. The force was even greater then; by that time it was just past 8pm. The window on the northern side of our master bedroom burst and the wind started coming into the house. Soon after that I heard the roof of the house stating to crack and groan so I realized that the roof was under tremendous strain, so I told my family to put on the necessary clothing and shoes and let's go downstairs. About half an hour after the roof was gone. I can tell you it was a scary and frightening night for us," he said. Doctrove said that during the passage of the eye of the hurricane he decided to step out to check on his neighbours; there was a family of six in a house and their roof had been blown away so he asked them to come across to his house. "The eye was very short, about 15-20 minutes, unlike Hurricane David which I experienced and was about an hour. So we had to hurry. We went to my basement but when that wind started howling again the garage gate was under tremendous pressure making it unsafe for us. So we had to brave the conditions and go to the second floor of the building and that is where we stayed. "In the process of moving to the second floor we had to contend with the wind which had taken hold of a door. We tried desperately to hold it but realizing that the conditions were not safe, we let it go and no sooner had we done that it went crashing down by the force of the wind. We narrowly escaped injuries. The wind was in full force downstairs. I thought that all my mementos and memorabilia would have been destroyed but thanks God that was not the case. "We had no roof and the rain was pounding and coming into the house making its way into the downstairs where we were sheltering, 11 of us in the room, with water well above our ankles. I was in contact with another of my neighbours whose roof had gone and who wanted to come across with his family. He was sheltering in a cupboard. I advised him to stay where he was since coming outside was dangerous. "The house was literally shaking like it was going to collapse and I prayed and asked the Good Lord to save us since the storm had already taken the roof and done tremendous damage to the house. "About 4:30-5am when the intensity died down I went upstairs and looked out. I was totally shocked to see the extent of the damage to my house and the surroundings. I had sheetrock and all came down. I lost all. I was almost in tears when I saw the damage done but as head of the family I kept back the tears especially since we had guests with us," Doctrove said. After the storm they all hurdled together and each offered "a prayer of praise and thanksgiving to the Lord for saving our lives." After a few days Doctrove obtained tarpaulins to place on his roof. "Hurricane Maria was a frightening and stressful experience and one that I would not wish for my worst enemy and one that I would not want to ever experience again. I have just replaced my roof but I'm still missing windows and my ceiling. I am still in the downstairs not trying to put any undue strain on myself. "We have to give thanks to the Lord since many escaped death by a thread. We have an opportunity to learn from Maria and bounce back as better individuals and to love more. After Maria people were portraying friendship and camaraderie but this seems to have gone. So we, as a people, need to reflect on our relationship with each other in terms of the love that we portray and stop that animosity and hatred we display in the land. We are bouncing back slowly and I am hoping that Dominica can become a better country."